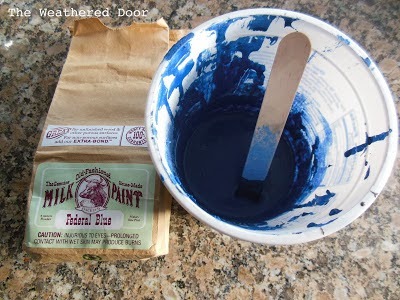 Real milk paint (that comes in powdered form) is one of my favorite paints to use. It’s not the most widely used form of paint and I often get questions about it and how I use it. Here is some helpful information I’ve learned in the last year and a half of using milk paint. When I first began using it I knew very little about it so I learned a lot from reading up on it and from trial and error. I love the blues in Miss Mustard Seed’s line. I’ve used 3 colors from that line and they are great. As I mentioned before, OFMP is the milk paint I use most, and I would probably say my favorite. The Real Milk Paint Co. has many color options as well and they also offer some unique, bright colors in different lines. The prices of those colors are more than their regular line, but if you are looking for something bright, check out what they have to offer. Sweet Pickins Milk Paint is manufactured by The Old Fashioned Milk Paint Co., so all of the OFMP colors are also available through her line, but SPMP also has a few (with more coming!) custom colors that are not offered by OFMP. As with all paint, I start by removing hardware from a piece, filling any of the hardware holes and other spots. Next I sand the piece. Most of the time I sand by hand with 150 or 220 grit sandpaper. Sanding sponges work great for the flat areas. I fold the sandpaper to get into some of the crevices and details, or on curved parts of a piece. I don’t tend to use an electric sander, but if I do it’s usually on the top of a piece that has a chipped or peeling finish that needs to be smoothed out. Once I’ve sanded, I vacuum the piece and then wipe it down with a damp cloth to remove any dust particles. ***Tip***If you are filling hardware holes, use a wood filler that is as close to the color of the wood you painting as possible. Most of the pieces I paint have a medium to dark wood finish, and a light wood filler will show through even after 3-4 layers of paint. I use a wood filler that is tinted darker and it solves this problem. Now, one thing I’ve learned with milk paint is that the paint can leave a lot of variation. That’s one of the things I love about it, you get lighter and darker streaks since it is made from natural pigments. Milk paint will also soak into wood (which is why it leaves such a durable finish), but if you have a piece that is sanded to raw wood in certain areas and not in others (either from the prep you did, or just from wear over time), this will most likely come through the paint. Those areas (scratches, water rings, dents, stains) will appear lighter or darker, so even though they have been covered they will still be noticeable. I don’t mind this to a certain extent. Obviously when restoring or painting old furniture there is wear and tear, but that’s part of the story and history of a piece. Other times, a piece is just abused and has problems you may not want to show through the paint. To deal with this I would recommend sealing the piece with clear shellac. To get an even finish before using milk paint, or to stop and prevent bleed through, seal the piece with Zinsser clear Shellac. This stuff is a lifesaver! It comes in a can (quart or gallon) as well as a spray can. I have and use both of these. The can is super easy to use to spray a piece down, but to me it’s more cost efficient to purchase shellac in a quart. I do have to use a foam brush or throw away the brush once I’m finished since this product doesn’t clean up with water. The reason I love this stuff is because it blocks out stains and smells, it dries super fast, and it’s clear. If you want that chippy look that milk paint can offer, this stuff can act as a primer (to stop bleed through), but you don’t have to worry about seeing a white layer of primer when the piece chips or you distress it. I’ve also found that the shellac also helps the milk paint to stick and adhere more then if you just apply milk paint without the bonding agent to previously finished wood. If it does chip, the chips and flakes are smaller than when I have not sealed a piece first with shellac. Also as a side note, I don’t just use shellac with milk paint, it’s great with other paints as well. I use it when I need to prevent bleed through on a piece that I’m not painting in white, so if I distress, I don’t have the white primer showing through. One of the attractive properties of milk paint is the authentic chippy finish it can offer. Milk paint was originally made and used on unfinished wood because it would soak in and sit on a piece, which created a durable finish. Nowadays it is used a lot on old furniture that has already been finished and sealed. When used on a previously sealed piece milk paint has a tendency to resist, which leads to random crazing (looks like a crackle finish) and chipping. It can look like the wear and chips happened over the years, but really, the milk paint just recreates that look with minimal effort. I personally think this chippy look is great on certain pieces, but since it’s random and uncontrollable how much and where the chipping occurs, I usually add the bonding agent. The bonding agent is sold separately and is added to the first coat of milk paint. It helps the paint adhere to previously finished surfaces. Most brands of paint say to use 2 parts paint to 1 part bonding agent. Sometimes I use less if I am open to having some chipping. I do want to point out that even if a piece is prepped (sanded) and the bonding agent is added, it can still chip. Most of the time the chipping occurs in the recessed and detailed/carved areas where the paint naturally pools. Factors than can increase the amount of chipping are how many layers of paint (and how thick each layer is, more layers usually = more chipping) and how fast it dries (putting a heater on it will probably increase chipping). To some extent you have to give up some control when using milk paint and know that as much as you may try to have the piece turn out exactly as you envisioned, milk paint has a mind of its own and can do its own thing. If milk paint is stored properly (in an airtight container), it can last indefinitely, but once mixed it does have a shelf life. Milk paint has casein in it, which will spoil. After mixing it, the paint can be stored up to 3-5 days in the fridge (covered/sealed), but try to mix as much as you need and can use within 24 hours or so. I like to mix milk paint in small, disposable plastic cups. I also have a box of tongue depressors someone gave me a while ago and always use them to mix milk paint since they are the perfect size. I start by pouring in as much of the powered milk paint as I need. I then add warm water. I don’t measure, but one part powdered paint to one part water is the ratio that works best. I do like my paint thinner rather than thicker, so I mix it and add more water until I get the consistency I like. Make sure to add enough water. Do not add just a tiny bit and mix it into a paste first because it can be hard to get a smooth consistency after that. I use the tongue depressor/paint stick to smash the clumps against the side of the cup and mix for about a minute or so. Then add the bonding agent if you want a cleaner look, or skip it if you want a distressed chippy look. Once mixed, and here’s the tough part, leave it. The pigments need time to dissolve, and letting it rest also gives it time for the clumps to absorb water and mix in. Mix up the paint and then leave it for a good 20-30 minutes. The paint will be much smoother and give you a better painted finish. It also allows the foam and bubbles that form on the top to go away. I think a problem people have is mixing it and using the paint right away. I usually mix it, go change into my painting clothes and finish any prep work (although I usually do that before mixing the paint) like taping off the sides of the drawers to get clean lines and taping off around the inside of where the drawer fits. I also give the piece one last wipe down with a paper towel (not damp or wet) to get any particles off of the surface that have settled. I then go back and mix the paint some more and try to get rid of the last of the clumps. The paint may have thickened during this time, so add a bit of water if needed to get it back to the consistency you like. While painting be sure to mix the paint every 10 minutes or so to keep the color uniform and the pigments evenly dispersed. Another great thing about milk paint is the colors can be easily mixed to create custom colors. I personally mix the powder together to make the color I want and then add water, but you can also mix each color with water in a separate cup and then pour them together until you get the specific color you are after. I mix up the color in a large cup and once I get the color I think I want, I put a very small amount into a Dixie cup and add water just to make sure it is the color I expected, if it’s not, I add other colors until I achieve the right one. The only negative thing I have to say about mixing custom colors is sometimes I have a hard time judging how much paint I will need and I mix too little. Obviously this is a problem because if you run out you have to try and mix more that matches the color you originally mixed. ***Tip ***If you find a mixture you like, make sure to keep a sample and write down the ratio and colors you used so you can create it again if you want! Saving the paint stick you use and writing on that is the easiest. I just use a regular 2” angle brush to paint (I use the same type of brush with all paints I use) and most of the time I use 2 coats (if I am okay with the variation and some wood coming through) and 3 or 4 coats if I want more of a clean, opaque looks. Some colors take more coats, some take less. I think I use more coats of paint since I mix and like my milk paint to be thinner rather than thicker. I like to paint on the first coat (in the evening) and then try to wait until the next day to do the second and/or third coat. If you can’t or don’t want to wait overnight, I recommend at least 6-8 hours in between the first and second coat. If you try to paint on the second coat without giving the first one enough time to cure, it can take off the first coat in some spots which will create more work in the end when you have to do an extra coat to even it out. It’s worth it to wait. After all of the coats of milk paint are on the piece, it’s time to smooth out the finish and distress if you want. If you skipped the bonding agent and ended up with a chippy finish, take a spackle knife and get as much of the flaking paint off as possible. Then, take a vacuum (I have a brush attachment for out shop vac that is great) and vacuum the piece off. Next you want to take a high grit sandpaper (anywhere from a 320-400 grit) and smooth out the finish. Make sure to sand in long strokes all the way from one end to the other of an area in order to get an even finish. If you don’t the sanding marks can be visible even after the piece is sealed. Once it is sanded and smoothed out, vacuum it again and wipe the piece down. Wax: Wax is a great option, but it may not be the most durable or the most carefree. I don’t necessarily love applying wax, it is kind of strenuous and while it does protect against spills to some extent, there are better options. Wax is also supposed to be reapplied every 6 – 12 months which is not great if you are selling pieces (customers want a more care-free finish). I have spilled water on a nightstand I painted in milk paint and sealed in wax for myself, and even after wiping it up right away (within 20 seconds), and getting it all soaked up it looked like the paint color deepened in the area where the water was. It did dry a few hours later, but it left some color variation and just didn’t seem like the wax is the most durable, especially for pieces that see a lot of traffic. I will use wax as a final coat over poly if I need to even out the finish (more on that in a bit). With wax, 2-3 coats are recommended to build up a durable finish. The wax I have and use is General Finishes finishing wax and Maison Blanche clear wax. Poly: This is what I use most often. It’s durable and does not need to be reapplied often like wax. I am a big fan of General Finisheshigh high performance poly and use it on almost all of the pieces I paint. If you use poly, I highly recommend you use a flat or matte finish poly over milk paint. I have used satin and it leaves a streaky finish. This can happen a bit with flat poly as well, but it far less noticeable (if at all on lighter colors). Milk paint is a very flat and porous paint, so when you apply poly (I just use a 2” angle brush) the paint will soak in the poly. You want to apply a nice coat of poly (don’t try to do thin coats, a bit thicker is better) and make sure you apply in it in strokes from one side to another. Don’t go over an area again and again. Brush it and let it be. Overworking it results in an uneven finish. Also make sure your brush strokes all go in the same direction. Once I’ve applied the first coat of poly (and it’s dry), I take a 320 grit sanding sponge or just a piece of sand paper and very lightly go over the whole piece. [As a side note, when I paint a piece with milk paint and it does not have a chippy finish, I do not sand the piece between coats or before sealing it, I sand after the first coat of poly] This evens out the finish and leaves it extra smooth. I then wipe it down with a damp cloth, and apply 1-2 more coats of poly. If the finish (sheen) still seems uneven after 2 coats of poly, I like to finish it with a coat of wax. This adds another layer of durability and evens out the finish a bit more (especially on darker colors). I notice an uneven finish on darker colors more than with lighter colors (it looks streaky if you see it at the right angle with the light hitting it). Most of the time I don’t use wax over the poly, but it’s a good tip if you are having trouble getting an even finish. 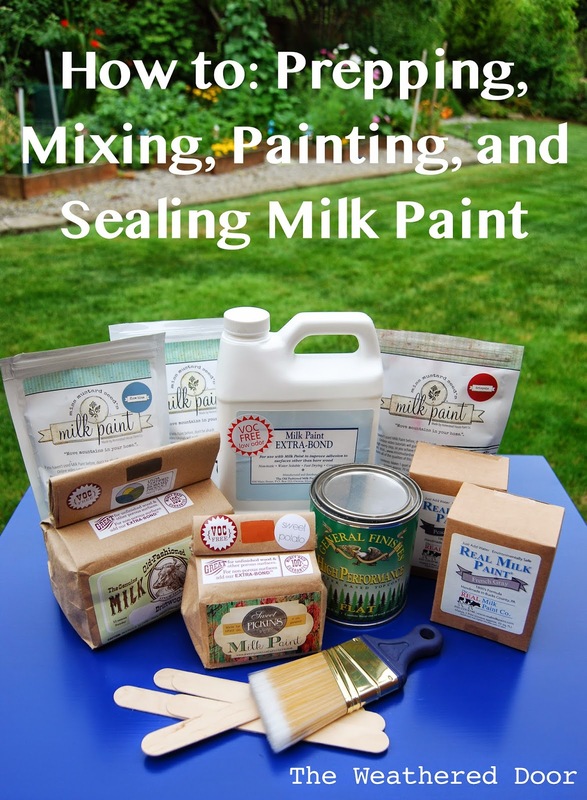 Oil: Hemp oil is a common sealer for milk paint as well. 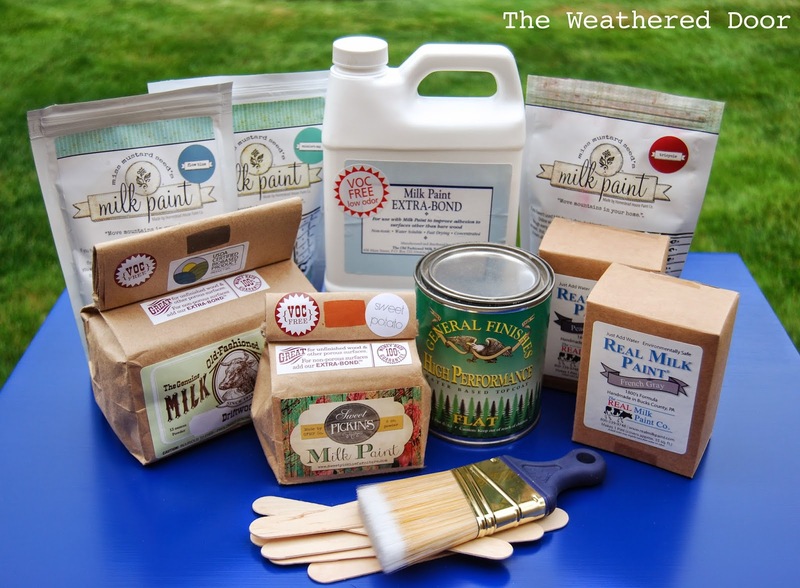 Miss Mustard Seed sells a hemp oil sealer in her line of paint. I’ve never used that specifically but I have sealed a piece with different oil before. Another option is tung oil. Oil definitely deepens the color more than wax or poly. It seeps into the paint and the wood to really seal it. Hemp oil is food safe (it’s also good to seal wood that isn’t painted). This is another good option for a sealer. Like with other sealers, you need multiple coats to build up a good finish. So, all these options work, you just have to figure out which you prefer to apply and which will work with how the piece will be used. Any pieces like a kitchen/dining table, dresser top or coffee table I would highly recommend using poly on. If you don’t like applying or using poly, try just using one coat on the tops of pieces (the top is the area that will see the most traffic) and then use wax over the whole piece. Hopefully this didn’t scare anyone off 😉 Milk paint is a really great option for painting furniture. I use milk paint on most of the antique pieces and some of the vintage pieces I paint. The paint just gives this unique look and finish with minimal effort on my part, and I love that about it. 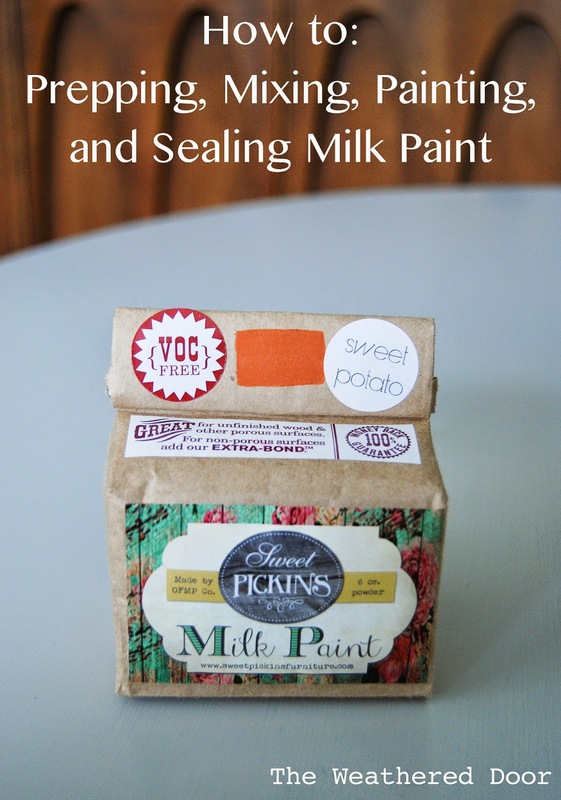 Hopefully this post gave you some tips and insight into how I use and work with milk paint. Maybe it even gave you the push to try it out! I’d love to hear how it goes. *I was not paid, nor am I affiliated with any of the companies or products mentioned in this post. I genuinely use and love the products I mentioned. All information, photos, and opinions are my own. Disclosure: this post contains affiliate links. Can I just say, thank you! This is the best explanation of how to use milk paint…and I have been reading about it for almost a year! You have helped to take the mystery out of the mixing process, and mixing with the bonding agent process. The colors are lovely, but I've really been reluctant to experiment too much with it, as I am not a fan of trying something new and then failing! Ha! I do have a package of MMS Milk Paint that I bought about a year ago. I painted one small chair so there is plenty of the powder left. Do you think it is still okay to use the powder? I think I sealed it well when I first used it. Thanks again, Reeves! Great Post! I was wondering you said you paint in white before milk paint. I am getting ready to do a dozen Windsor and Ladderback chairs for my cabin. I wanted to base coat in black latex then apply milk paint over top. then sand the edges for old wear look to them, my house is 200 yrs old and I am looking for that old look. Any experience with that? Wow, what a great comprehensive post! I love to hear what products other furniture painters like and why. Thanks so much for sharing! Thanks Reeves! I'm going to use OFMP on my next piece and this post was so helpful. Does milk/chalk painting your antiques make the value go down? Thank you for this article! I realize it’s well over a year old but I thought I would try to ask you a question anyways. I just bought some MMS Milk Paint in the color Artissimo and I’m preparing to paint a piece of unfinished pine furniture. I know I want to seal it with wipe-on poly, but I’m wondering if I can also use an oil to deepen the color before applying the poly. I was thinking mineral oil since I already have some on hand. Will this work or will the oil ruin the poly? Thank you for all the information. I am currently using milk paint for the first time and honestly I am not to happy with it. It is chipping very bad on a surface of a dining table (the skirt) that i cleaned and sanded well before painting. On the legs I did the same thing and have already sealed those with hemp oil and it continues to chip. I tried this paint because it was highly praised by the retailer and if it was my own table I would not care, I like the look but it is a customers and I don’t want to take the chance. Any advice on how to prevent the chipping? Also with the shellac, to save you some money, it is alcohol based so instead of buying foam brushes over and over again when using or having to get a spray can, buy a gallon of denatured alcohol (will last a while) and take the brush you used and either clean it with that or you can let the shellac dry all the way on the brush and let it sit in denatured alcohol for around 30 minutes and the brush is as good as new and ready to use. I use shellac often to seal the furniture I build and just let the brushes dry and once I need it I just let it soak in the alcohol to melt the shellac away. Thanks again for all of the help. If you don’t want chippy, I would not use milk paint. There are much better, more durable paints out there that are great for pieces/areas that receive high traffic. I would consider milk paint to be a specialty finish paint. Also, the bonding agent is needed if you don’t want the paint to chip, and even then there are certain things that will still cause it to resist the surface it is being put on, which results in chippy paint. Originally milk paint was used for raw wood, so it would soak in and bond well. Great post. This will really help me. I would like to ask a question. We made a new top for our kitchen table that is stained darker walnut brown. The existing bottom of the table is painted white. The Windsor chairs are painted white except for the seats that are stained a blonde finish with poly on top. All per existing parts are oak. I would like them painted white but distressed to show a similar brown underneath as the table top. Would I need to paint them with brown paint first then sand and then use milk paint on top with a bonding agent? Or could I use milk paint on both layers? I also read I could use a wet rag to wipe away some of the white paint. Is this true? Sorry I do not live in the same state or I would come to your shop. New to milk paint. I’ve just started using hemp oil to seal pieces, and it seems that when anything is set on the surface afterward, even a t-shirt, it soaks up the oil and creates dry spots. Will the whole surface dry out evenly eventually?? Oil finishes do need to be reapplied overtime.